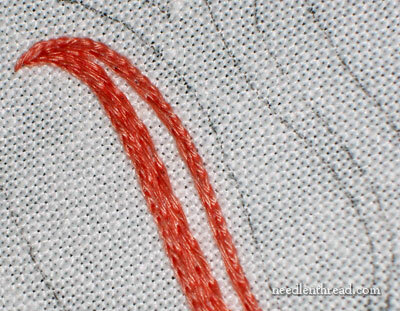 When thread and stitch work well together, it can be very satisfying! Even though I’ve only stitched a tad on the upcoming embroidery projects I showed you last week, the experience was a good one. The result – amoré! I love floche, I love satin stitch – and I adore the marriage of the two. I’ll tell you what drew me in to taking the satin stitch seriously and made me realize that I had to get the stitch right. One day, I saw in an antique store in New York City a gorgeous piece of antique monogrammed linen. I can still picture that linen clearly. The satin stitch was so smooth, so silky, so perfect that I was mesmerized. I studied the piece, I held it in my hands, I even stroked those lovely satin stitches. I contemplated their uniformity, their fine, straight edge, their padded height. It was …. *sigh* …. beautiful. Seduced by a pillow case, I fell in love that day – with satin stitch. Satin stitch is a beautiful stitch when it’s worked well. When it’s messy, it tends to detract from the finished project. I learned this right away, with my first foray into real satin stitching. I made up my mind that The One Stitch Worth Learning well is satin stitch. 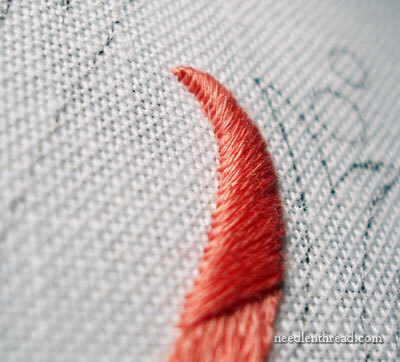 A beautiful satin stitch can change a ho-hum project into a masterpiece. Floche is a beautiful cotton thread for surface embroidery, but it’s especially beautiful in satin stitch. The soft twist of the thread, the way the light catches it, the way that it coats an area – all of these characteristics in floche are magnified when used for satin stitching. Floche works beautifully with other stitches, too – like the split stitch outline and the long split stitch filling in the piece above – but it is shown off to its best advantage when paired with satin stitch. 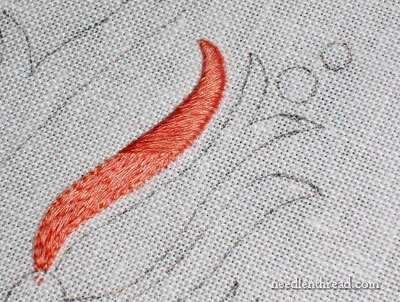 Of course, floche isn’t the only thread that makes a beautiful satin stitch. Satin stitch, when worked with the Queen of All Threads (silk), is exquisite. But there’s something about floche and satin stitch. They are the ideal couple. They just go together. You’ll see this project as it unfolds, and I’ll share some tips along the way. But it’s not all satin stitch. Though mildly obsessed with the stitch, I realize there are other fillings out there that deserve the spotlight now and then, too! Still, by the time the project’s finished, I hope you learn to love the combination of floche and satin stitch as I do! Cotton Floche: What’s Not to Love? Can you Separate Floche? Yes. Yes, I think that it was satin stitch that made me want to embroider at it is still the stitch that I am most drawn too. I would love to stitch it to the same standard that you achieve. That red looks beautiful on the linen. You are 100% right. At age 4 my mother taught me the Daisy Stitch and the Satin Stitch. Throughout the years, I never mastered the satin; I did not try to after a few childhood attempts,which inevitably fell short of perfection. Practice makes perfect and I had not the patience to pursue perfection, always chasing after another sewing interest until finding my perfect niches to finally excel at. But the elusive Satin, your forte, Mary, is a divine, stand-alone category, of which you are the sole master by name and by trade. It is a euphoric indulgence to view your work. I just watched the video on satin stitch. I think that I will be able to make mine look much better now. For those of us new to this thread and hand embroidery, it appears that the numbering/colors of the floche might be the same as the numbering/colors for the DMC 6 strand floss. Is this correct? If so, then that makes it so much simpler to select the correct color of floche. Next Next post: Which Needle?